Additional Paid In Capital (APIC) is the value of share capital above its stated par value and is an accounting item under Shareholders’ Equity on the balance sheet. APIC can be created whenever a company issues new shares and can be reduced when a company repurchases its shares. APIC is also commonly referred to as Contributed SurplusContributed SurplusContributed Surplus is an account of the equity section of the balance sheet that holds any excess amounts made from the issuance of shares with a par value. 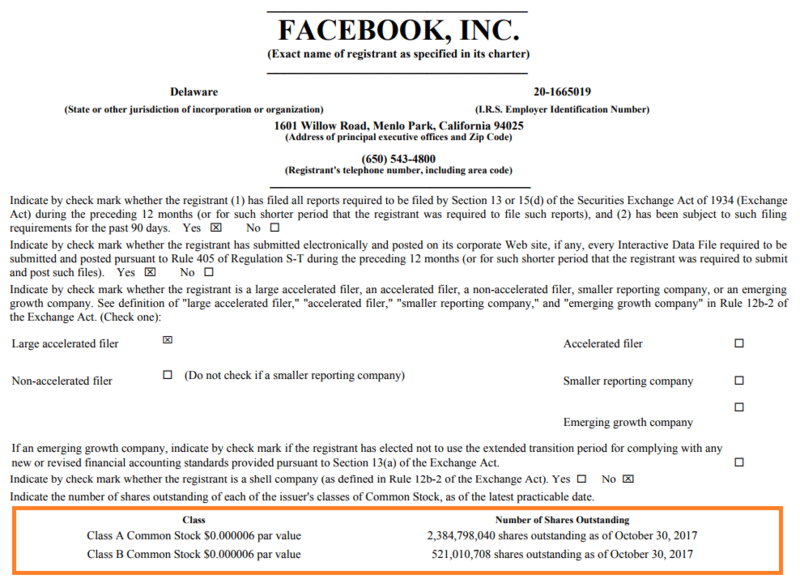 This account also holds gains and losses from the issuance, repurchase, and cancellation of shares, as well as gains and losses from the sale of complex financial instruments..
As you can see with Facebook, in the example above, Additional Paid In Capital is created as a result of issuing shares at a price higher than their par value. As of September 30, 2017, Facebook has issued $40.199 billion of share capital, all of which is listed as APIC on its balance sheet. 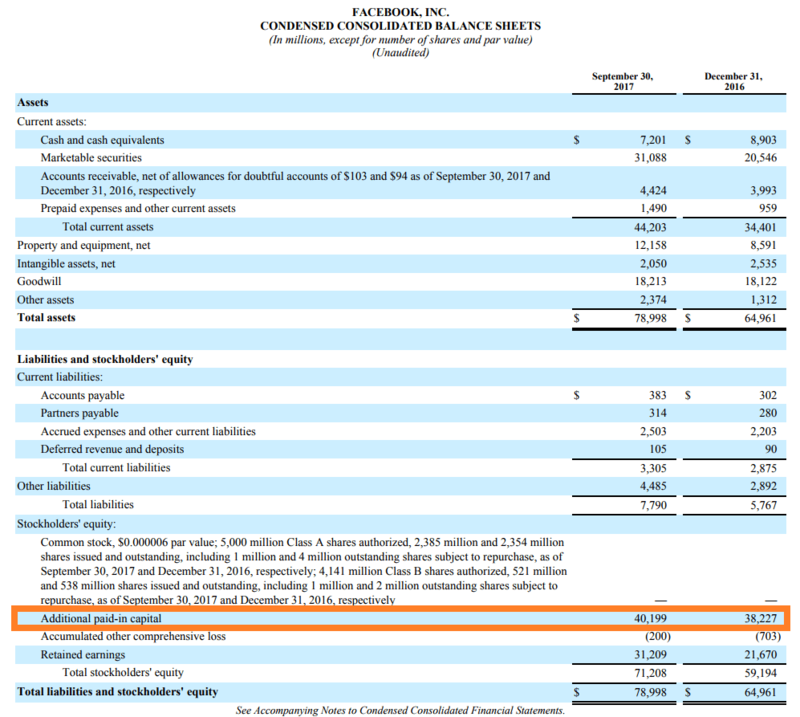 Since the par value of its common stock is only $0.000006 per share, the total is less than $1 million (which is the units it reports in) so it shows as zero on the balance sheet. Additional Paid In Capital is only dependent on the issue price of equity, not the market value. Once a company’s shares start trading on a public exchange, their price movements don’t impact the APIC account on the balance sheet. Let us break down the above example into some basic steps to see how the additional paid-in capital is calculated. Here is some more detail from the front page of the company’s 10-Q quarterly report. Take the total Class A common shares outstanding of 2.38 billion and multiply them by $0.000006 par value per share. Take the Class B common shares of 500 million and multiply them by $0.000006 par value. Add the Class A and Class B totals together to get $17,309. Divide $17,309 by 1 million to get the appropriate units on the balance sheet, which rounds to $0.0 million. 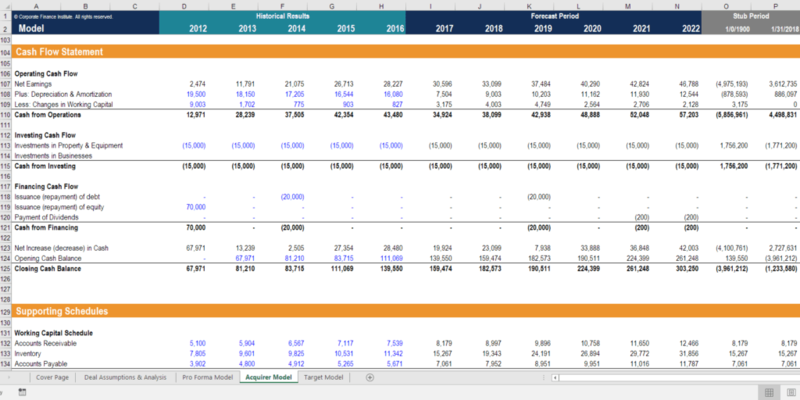 When performing financial modeling in Excel, it’s important to properly account for a company’s share capital and total shareholders’ equity. A separate schedule in the model can be created to track the par value, issue price, and any new issuance or repurchase of shares. Contributed SurplusContributed SurplusContributed Surplus is an account of the equity section of the balance sheet that holds any excess amounts made from the issuance of shares with a par value. This account also holds gains and losses from the issuance, repurchase, and cancellation of shares, as well as gains and losses from the sale of complex financial instruments.